Picture this. You have a passion so big, you never stop thinking about it. Your life becomes that passion and you want to turn that passion into a business so that other people will benefit from it. Eventually, your dreams come true. Now you’re out in the community, sharing your business and telling people about how your dreams became a reality. Sounds like the American Dream, right? Also sounds like Reckoning Fitness. More on them soon. We are so proud to support businesses that are making big things happen. Watching their brands come alive on a pop-up canopy is music to our ears. At KD Kanopy we strive to help these businesses stand out with custom, bold, unique designs. Our branding tools are made with these businesses in mind. We know you’ll be out in the elements doing everything you can do grow your business so we create them to be easy to use, long lasting and of course, memorable. Back to a local business who has recently become part of our KD Kanopy family, Reckoning Fitness. We love what this company stands for and what they have to offer. They join a few companies you may have heard of who also started their journey inside their garage including Apple, Amazon, Google, HP, and the Walt Disney Company. Pretty impressive. 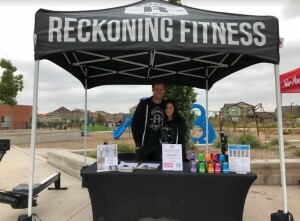 We know big things are in store for Reckoning Fitness and now they have a fabulous, eye-catching pop-up canopy to help them get there. This husband and wife duo, Esther & Chad, have started their fitness business in the heart of Denver after both having a lifelong passion for fitness and nutrition. Crossfit changed both of their lives and brought them together, now they are doing the same for their community. They are excited to help you program your workout, fit it to your intensity, and offer nutritional guidance along the way. You can get started on your own fitness journey with a variety of different membership options including month-to-month, 6 & 12-month contracts, personal coaching, punch cards, and drop-in passes. We love helping businesses grow and look forward to watching Reckoning Fitness be one of those businesses. Contact them now to get started!